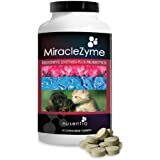 Users reported their dogs had firmer stools, better skin condition, less itching, allergies and gas, and improved overall wellness with a probiotic supplement. Dog probiotics are different than human probiotics. Probiotics for dogs are specific because bacteria is host-specific. For this reason, human probiotic supplements are not equally beneficial for dogs. Also, adding plain yogurt to your dog's diet may not harm your dog, but there is not a sufficient amount of living viable probiotics in yogurt to truly benefit your dog. 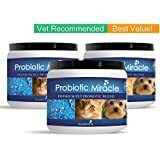 When you supplement your dog with the best probiotics you’ll notice numerous natural health improvements that come along with having a healthy gut. Dogs on antibiotics will be deficient in healthy bacteria (probiotics) in the gut since antibiotics strip your dog's gut of all bacteria. Aging dogs will naturally have a lower volume of healthy bacteria in the gut and require probiotic supplementation. Dogs fed a typical diet of processed dry kibble are susceptible to low healthy microflora. Stress contributes to an imbalance in the microbiome (dog's gut). Puppies are born with their guts sterile, so supplementing your puppy with probiotics early on may give them a "leg up" on fighting illness later on. The best probiotics pass through your dog's stomach acid and bile, then implant in the gut where they multiply hundred-fold. This is when they become part of the collective microbiome and go to work. This process is important, because many probiotics will not survive passed the stomach, or, even the mouth. Acting as intestinal law enforcement—they maintain the gut wall and keep out bad guys like harmful, disease-causing bacteria. Liquid formulas are generally less stable and require refrigeration. Liquid probiotics are also generally less efficacious than stabilized powders and tablets. A dose of probiotic powder should be undetectable on your dog's food, so there's no need to load the formula up with fillers, flavors or undesirable byproducts. Also, a good probiotic will contain a prebiotic, such as, FOS. A good product has stood the test of time. What are the pet owner's saying? Does the manufacturer provide a money-back guarantee? These are no-brainers. Picking a good probiotic requires an understanding of CFU, and bacteria. High volume/multi species formulas can be problematic for your dog's body, and there's little research to support the benefit of these formulas. Does the formula contain only 1 species of bacteria? That's not enough for your dog. Research supports between 3-7 species having benefit to dogs. Vet Immunol Immunopathol. 2012 Apr 15;146(2):185-9. doi: 10.1016/j.vetimm.2012.02.013. Epub 2012 Mar 1. Early exposure to probiotics in a canine model of atopic dermatitis has long-term clinical and immunological effects. R, Santoro D, Ahrens K.
Vet Ther. 2009 Fall;10(3):121-30 Clinical benefits of probiotic canine-derived Bifidobacterium animalis strain AHC7 in dogs with acute idiopathic diarrhea. Portrait of a canine probiotic Bifidobacterium–from gut to gut. O’Mahony D, Murphy KB, MacSharry J, Boileau T, Sunvold G, Reinhart G, Kiely B, Shanahan F, O’Mahony L.?Vet Microbiol. 2009 Oct 20;139(1-2):106-12. doi: 10.1016/j.vetmic.2009.05.002. Epub 2009 May 19. Evaluation of efficacy of probiotics in prevention of candida colonization in a PICU-a randomized controlled trial. Kumar S, Bansal A, Chakrabarti A, Singhi S. Source Department of Pediatrics, Advanced Pediatric Centre, Chandigarh, India. Anim Health Res Rev. 2012 Jun;13(1):78-88. doi: 10.1017/S1466252312000059. Epub 2012 May 30. Current state of knowledge: the canine gastrointestinal microbiome. Hooda S, Minamoto Y, Suchodolski JS, Swanson KS. Eksp Klin Gastroenterol. 2013;(2):54-64. Perspective applications of multi species probiotics in the prevention of antibiotic-associated diarrhea. Can J Microbiol. 2013 May;59(5):347-52. doi: 10.1139/cjm-2012-0472. Epub 2013 Mar 19. Synbiotic administration of canine-derived strain Lactobacillus fermentum CCM 7421 and inulin to healthy dogs. Strompfová V, Lauková A, Cilik D.
DISCLAIMER: The contents of this website are based upon the opinions of ProbioticsforDogs.com. This site is intended as a sharing of knowledge of the scientific research of our health professionals, and the experiences of our product users. We encourage you to discuss all your health concerns about your pet with your veterinarian. It is your responsibility to discuss this with your vet and make sure it is appropriate for you pet's health. The information contained on this web site is not intended to be a replacement for the advice of your own veterinarian. The information contained in this web site is not a substitute for an examination, checkup, or treatment when your pet has a health problem.